File photo Northmor’s Conor Becker ran his way to Division VI, First Team All-Ohio honors this season, racking up over 2,100 yards on the ground while leading the Golden Knights to their first playoff win in school history. COLUMBUS — With the end of the high school football season drawing near, the Division VI and VII All-Ohio teams were announced on Sunday with the Division IV and V teams being announced on Monday. The Division II and III teams will be announced on Tuesday and the Division I All-Ohio team and the Ohio Mr. Football Award will be announced Wednesday. Northmor’s Conor Becker and D’Marcus Hudson achieved the highest honors locally, both were named to the first-team Division VI offense. 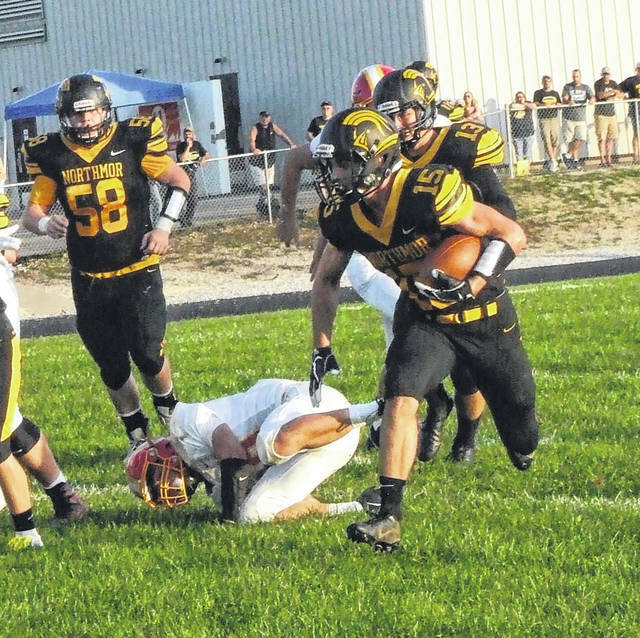 Connor, a junior running back, rushed for more than 2,100 yards this season. One of those paving a way for much of that yardage was Hudson, a senior. Listed below are the Coach of the Year, Offensive Player of the Year and Defensive Player of the Year awards for Divisions IV-VII. Also listed are members of their respective All-Ohio teams that represent the conferences covered here at the Galion Inquirer. Second Team Offense: Wide Receiver: Chase Carpenter, Marengo Highland, 6-3, 190, sr.
Second Team Defense: Linebacker: Mitchell Miracle, Caledonia River Valley, 5-9, 180, sr.
Third Team Defense: Linemen: Andy Holmes, Caledonia River Valley, 6-1, 230, jr.
First Team Offense: Linemen: Carter Miley, Marion Pleasant, 6-4, 285, Sr.
First Team Defense: Linemen: Brayden Stark, Marion Pleasant, 6-2, 225, Sr.; Colton Clark, Richwood North Union, 6-0, 285, Sr.
Second Team Offense: Running Back: Patrick Blubaugh, Marion Pleasant, 5-8, 170, Jr.
Second Team Defense: Linebacker: Bryce Lowery, Marion Pleasant, 6-1, 220, Sr.; Punter: Anthony Padovano, Richwood North Union, 6-2, 185, Sr.
Third Team Offense: Running Back: Trevor Moran, Richwood North Union, 6-0, 185, So. First Team Offense: Quarterback: Kadden Laster, Howard East Knox, 6-2, 185, Jr.; Running Backs: Conor Becker, Galion Northmor, 5-11, 170, Jr.; Blaine Swartzmiller, Attica Seneca East, 6-3, 225, Sr.; Wide Receiver: Caleb Gallwitz, Howard East Knox, 5-10, 175, Jr.; Linemen: D’Marcus Hudson, Galion Northmor, 5-8, 195, Sr.
First Team Defense: Backs: Seth Benedict, Bucyrus Wynford, 5-10, 155, Jr.
Second Team Offense: Running Backs: Kasson Krownapple, Howard East Knox, 6-0, 180, Sr.
Second Team Offense: Running Backs: Mason Goers, Cardington, 5-9, 170, Jr.
Second Team Defense: Linemen: Dylan Wilson, Danville, 6-0, 250, Sr.
Third Team Offense: Wide Receiver: Corbin Hazen, Danville, 6-1, 197, Sr.
Third Team Defense: Linebacker: Bryce Kirian, Sycamore Mohawk, 5-10, 200, Sr.
https://www.galioninquirer.com/wp-content/uploads/sites/38/2018/11/web1_conorbecker-1.jpgFile photo Northmor’s Conor Becker ran his way to Division VI, First Team All-Ohio honors this season, racking up over 2,100 yards on the ground while leading the Golden Knights to their first playoff win in school history.